It doesn't get very cold where I live and it definitely doesn't snow. We usually get one 'snow day' a year and the snow is typically gone before noon. I like it that way, a LOT, but theses DIY Ice Luminaries make me wish that we had cold enough weather to make them. Just for like a day though. Actually it just makes me wish that they wouldn't melt so quickly in the 70 degree weather so we could make them in the freezer. I am a wimp when it comes to the cold! If you are having a party and ESPECIALLY if you are having a wedding someplace where it is super cold, I think these are a must! How fun would it be to light up the walkway with ice luminaries! 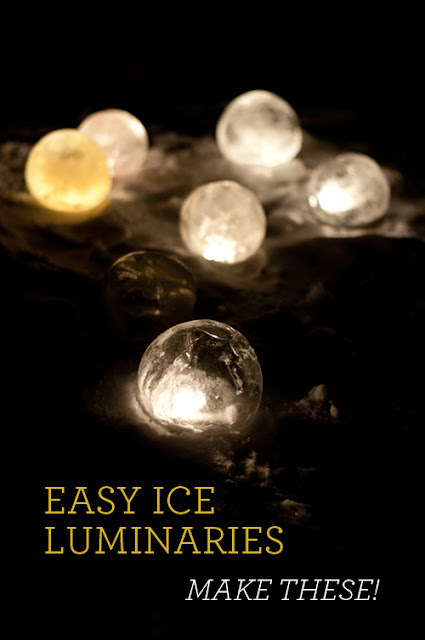 If you live somewhere colder, you can check out how to make these easy ice luminaries over at Design Mom.